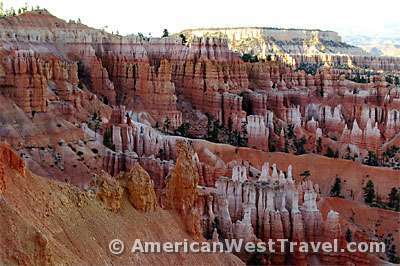 Bryce Canyon National Park offers many easy touring options. Most of the park’s major attractions and well-known hiking trails are within five miles of the park entrance in the area known as Bryce Amphitheater. The National Park Service operates a very convenient shuttle bus service in the Bryce Amphitheater area from early May to early October. Unlimited usage is included with your park entrance fee. There is also a free, guided bus tour covering the whole park to Rainbow Point at road’s end. The 3 1/2 hour tour makes numerous stops along the way. If you are not staying inside the park both buses may be conveniently boarded at the Ruby’s Inn complex just outside the park entrance. This symbol indicates a featured story on AmericanWestTravel.com. The Bryce Amphitheater region in the park’s north end features many of the most notable and popular attractions. The vista points and trailheads north to south are Fairyland, Sunrise Point, Sunset Point, Inspiration Point, and Bryce Point. All of the Bryce Canyon’s amenities are located here, including Bryce Canyon Lodge, North and Sunset campgrounds, the visitor center, and a general store. There is a Rim Trail connecting the vista points which is mostly level and offer different looks into the amphitheaters. The section between Inspiration Point and Sunrise Point is just over a mile long, with easy walking and a variety of good views. The trails that go into the canyon itself (meaning off the ridge) are steeply downhill and therefore strenuous on the return. Besides the uphill return walk, the high elevation combined with a very hot summer sun causes fatigue and dehydration – be sure to carry water and drink it. The Fairyland Loop goes through an area of very whimsical formations. By combining it with a section of the Rim Trail, you can do a one-way loop hike of eight moderately strenuous miles, with a few ups and downs. We found this far less crowded than the central area between Sunrise and Inspiration Points. The Queen’s Garden is the easiest below-the-rim trail and accesses the famous Queen Victoria formation. It is a 1.8 mile round trip to the formation and back from Sunrise Point. A longer loop hike of 2.8 miles is available combing parts of the Navajo Loop and Rim Trail. The Navajo Loop features the famous Wall Street slot canyon, as well as Thor’s Hammer. 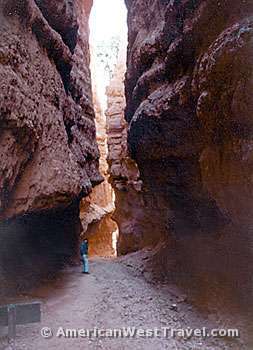 It is probably the park’s most dramatic and popular hike. It is a short 1.3-mile loop starting and ending at Sunset Point. However due to damaging rock slides and rock falls parts of this trail are often closed. Check at the visitor center or online for current status. South of Bryce Amphitheater, there is an excellent network of trails for backcountry hiking, which include a number of designated backcountry campsites. 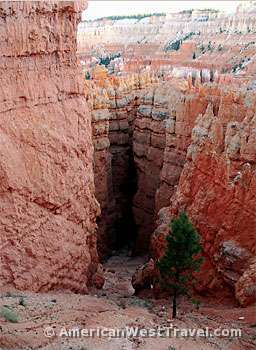 Bryce Canyon’s backcountry trails offer solitude, forests, meadows, wildlife, wildflowers and interesting geologic features. You must camp in the designated sites and can reserve them up to 48 hours in advance. There is a required permit fee. 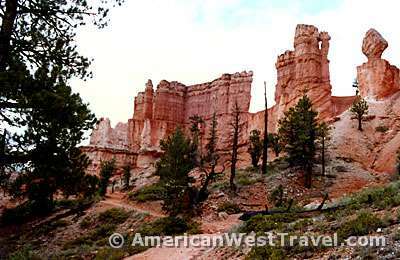 Accommodations within Bryce Canyon National Park include the Bryce Canyon Lodge and two campgrounds, North and Sunset. The campgrounds are in forested areas with some shade. There are no RV hookups but there is a dump station. There are flush toilets and drinking water; also, showers and laundry at the general store in the summer. Most of the sites are first-come first-served. However there are a small number of sites on the reservation system. The Bryce Canyon Lodge, built in 1924, offers rustic lodging (no television) from April through October and is located a few feet from the amphitheater’s rim and trail heads. Select from motel-style rooms or lodge pole pine cabins. Dining is available in the lodge. Ruby’s Inn offers a substantial resort just outside the park entrance with a very large number of modern motel rooms, as well as a full-service RV park and campground. It also has numerous stores, restaurants, and other amenities. Activities include horseback rides, scenic flights, a rodeo, guided ATV tours, a cowboy cookout, etc. Best Western Bryce Canyon Grand Hotel, within walking distance of the shuttle stop, offers 164 spaciously appointed guest rooms each complete with cable satellite television, free wireless high-speed Internet, microwave, refrigerator, and complimentary full hot breakfast. Additional amenities include an indoor heated swimming pool, exercise facility and outdoor swimming pool. Be sure to check out the Red Canyon Visitor Center and Campground, about ten miles west on Utah-12. 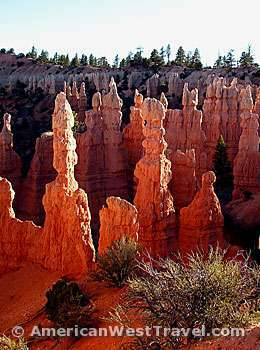 The formations are similar to Bryce Canyon but with a stronger red color as opposed to Bryce’s light pink shades. There is a modern visitor center, an excellent campground, and a very nice network of hiking trails. Red Canyon photographs better late in the day; Bryce Canyon is better in the morning. It is a very interesting, uncongested area. 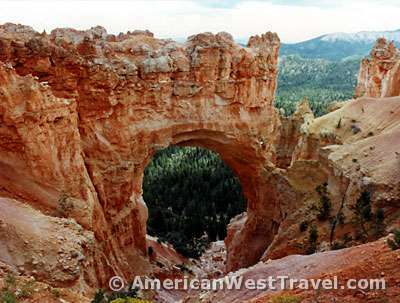 Location: Bryce Canyon National Park is located on Utah-12 about 20 miles east of US-89.